For any blog post, the headline is what catches the attention of the reader first. It works like a hook to pique the audience’s interest. A good headline can get people to read the posts that you write. But what makes a good headline? This question has marketers divided. Some experts believe that you should write headlines that are SEO-friendly. Others say your headlines should be melodramatic to attract readers. It’s a battle between SEO headlines and clickbait titles. But if you look at it closely, it’s not really a dichotomy. You can optimize your headlines for both people and the search engines. You can have your cake and eat it too! Before we dig in deeper, let’s take a look at what SEO clickbait headlines are. As the name suggests, SEO clickbait headlines are a happy marriage between SEO headlines and clickbait headlines. To understand this better, let’s look at SEO headlines first. You write SEO headlines for the search engines. These headlines include keywords that people are searching for. Google picks up SEO headlines because these headlines answer questions that users are asking. But the problem is that if you stuff your headline with too many keywords, it can come across as robotic. Your headline may rank well in the SERPs (search engine results pages) but it may not be engaging enough to attract readers. On the other hand, clickbait headlines aim to attract readers by providing them with a shocking revelation or an interesting statistic. Clickbait headlines get a bad reputation for being manipulative and sensational. At their best, clickbait headlines are compelling. At their worst, they can be misleading. But because these headlines create mystery and provide shock value, readers do click on their links. Websites like BuzzFeed and Upworthy churn out clickbait headlines every day to draw millions of views on their content. Their headlines evoke strong emotions and trigger the curiosity of the reader. Clickbait headlines also make their content share-worthy. It’s important to note, however, that if your headline is too over-the-top, people will call you out on it. This can put your brand’s reputation at stake. If you want to get the right combination of quality and engagement, you need a mix of SEO and clickbait headlines. Writing good SEO clickbait titles is not as hard as you may think. It’s all about getting into the mind of the reader. Once you know what readers are looking for, you need to present your topic in a way that will interest them. The first step in writing a good SEO clickbait headline is to list down the relevant keyword related to your topic. Once you have zeroed in on a keyword, run a Google search with that term and look at the search results. 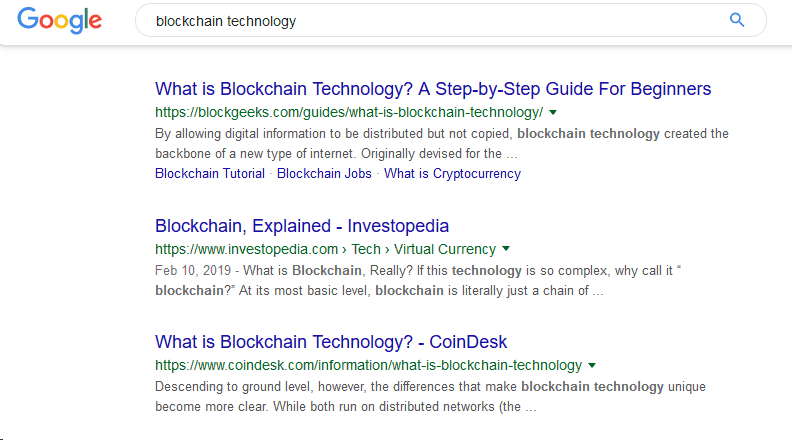 Most of the results in the SERPs have the keyword “blockchain technology” mentioned in the title. Even if the exact keyword isn’t used, a similar phrase is mentioned. This shows how Google wants to show results that are directly linked to the keyword you searched for. So, it’s a good idea to include relevant keywords in your SEO clickbait titles. For better rankings, it is advisable to include the keyword at the beginning of the title. Sometimes it is difficult to use the exact keywords that users are searching for. For instance, say a user is looking out for the keyword “New York lawyer.” It may not be possible to use this keyword in a headline that makes grammatical sense. In this case, you can use the phrase “lawyers in New York” as well. Since the context remains the same, Google also sees this keyword. Many clickbait headlines use words like “unbelievable,” “amusing,” or “shocking” to get the interest of the reader. Using these words promises to show the reader content that will stun them. When you start with such a promise, make sure your content is strong enough to deliver on it. If you aren’t able to back up the claims that you make in your SEO clickbait headline, you’ll lose your audience. Adding a pop culture reference instantly makes your headline more relatable. If you pick something that’s trending, it can also help you rank higher in the SERPs. Adding movie or song references is an easy way to increase your website traffic. You just need to be creative to find a way to link popular catchphrases to your blog topic. It shouldn’t come across as forced. In the example above, the topic is about seasonal splurge in winter. 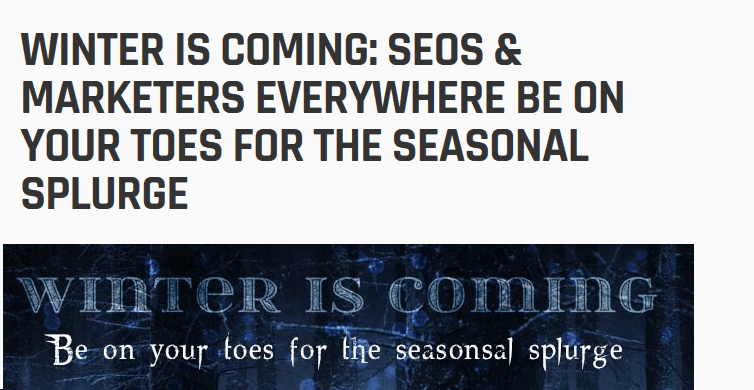 Here the phrase, “winter is coming” (from Game of Thrones) fits in organically. Using trending phrases can also give your posts a youthful and fun tone. Show, don’t tell. This is advice that writers around the world get all the time. Instead of just telling a reader about a concept, show them why it is important. For example, if you want to tell your readers how you increased your salary, use numbers in your SEO clickbait title, like in the screenshot below. “How I Increased My Salary” and “How Can You Increase Your Salary?” are pretty straightforward headlines. But they’re dull and not attention-grabbing. If you present the same subject with numbers, it instantly adds a bit of mystery. By using numbers, you’re definitely adding more value. It shows your readers what exactly they can expect in the article. The internet is full of listicles. Ever wonder why? Because they work well for both SEO and to get people’s attention. 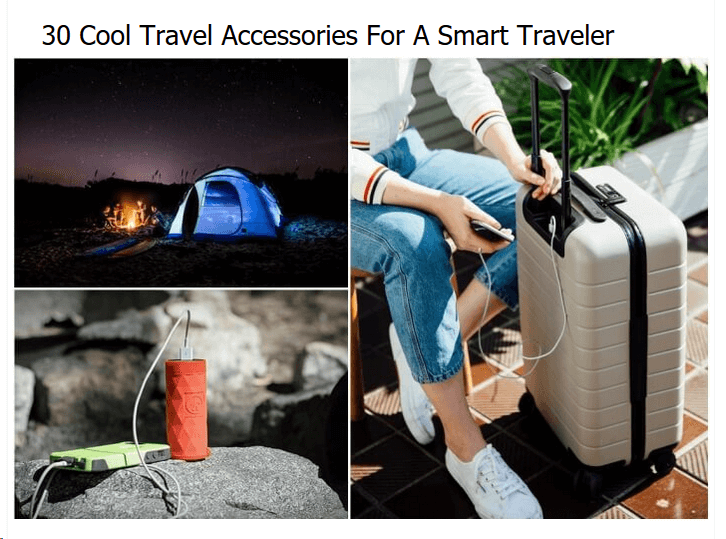 The biggest advantage of using the listicle format is that you can package any piece of content to fit the format easily. And it’s not very hard to come up with listicle headlines. Another added advantage of listicles is that they are easy to consume. With dwindling attention spans, listicles give the gist of the content, making it easy to scan. That’s why the format is widely popular. 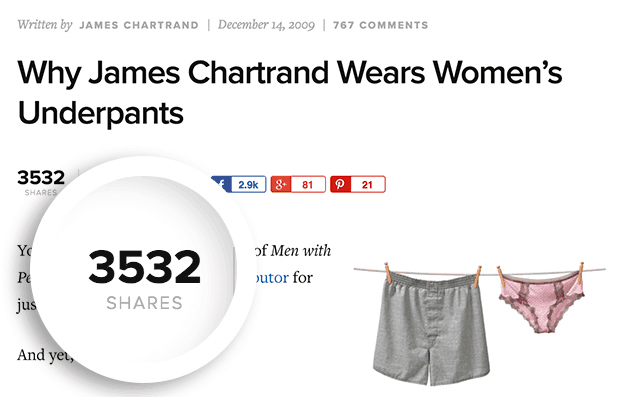 Join the listicle bandwagon if you want to get more clicks. Let your headline speak to the audience like you’re having a personal conversation with them. Addressing your audience in the second-person (use “you” and “your”) is a great way to build a personal rapport. If you want to take it a notch higher, you can also use first-person headlines. They give readers a stake in the personal life of the author and makes them feel more connected. These headlines work particularly well if you want to appeal to the emotions of your readers. Stir up controversy with your headline by offering a strong opinion. It’s the ultimate way to drive engagement. Content that is controversial has the potential to go viral because of the discussions it can stir on social media platforms. You can make your headline outrageous, silly, or even pose a riddle. It’s a sure shot way to turn your readers’ curiosity into clicks. That said, marketers should know that this strategy can also backfire if not used cautiously. Tread into this arena very carefully. Tickle your brain cells and brush up on your vocabulary. If you want your headlines to stand out, you need to choose your words wisely. Use power words to make your headlines pack a punch. Power words refer to words that can breathe life into any dull headline. If you’re still on the fence about using a particular headline, get some help. There are tools out there that can analyze your headlines and tell you how effective they are. You can use CoSchedule’s Headline Analyzer to find out if your headlines are missing something. This free tool provides a score based on the usage of emotive, common, uncommon, and power words. Other factors like title length and keywords are also analyzed. Because of this, it is one of the most effective tools to help you write SEO clickbait headlines. The dichotomy between SEO-optimized headlines and clickbait headlines isn’t really needed. You can combine these types of headlines to create SEO clickbait headlines. If you know the right strategies, you can easily merge a robotic-sounding SEO headline with a clickbait one. This hybrid version can drive your engagement and boost your search rankings. In which other ways do you create compelling titles for your blog posts? Share your tips with us in the comments section.